Haikasoru bills this as a collection of crime fiction from and about Japan, and as such, my initial response was mixed. Crime fiction usually is not on my list of preferred genres, but crime fiction did inspire other genres like Noir and urban fantasy, which I am personally more familiar with. Having seen Haikasoru publish quality collections and novel translations in the past, I decided to trust them. And besides, Hanzai Japan is a short story collection: certainly, there had to be a story in there that appealed to me. I wanted to read more fiction, after reading lots and lots of nonfiction lately. I wanted adventure, I wanted grit, I wanted streetlights in fog, and to feel the buzzing glare of neon signs against my eyes. Stories range from translated into English, to being originally written in English: the authors are of course clearly marked, but so are the translators, a detail I always enjoy. Translators—at least within the United States—do not tend to get enough credit when it comes to literary translations, so it is good to see an American publisher give them due credit for their hard work. Hopefully, Haikasoru will set an example in this regard for other publishers. Haikasoru is an imprint of Viz Media, and thus used to dealing with translators as well as Japanese-oriented media; the fact that we are dealing with short stories and an excellent set of editors (Nick Mamatas and Masumi Washington) helps expose an English-speaking audiences to a variety of Japanese creators. For reference, Haikasoru is the same publisher that brought to us All You Need is Kill by Hiroshi Sakurazaka—the science fiction novel that was adapted into the film, Edge of Tomorrow, as well as the novel Battle Royale by Koushun Takami (yes, that same Battle Royale of film infamy). Speaking of Hiroshi Sakurazaka, he has a short story in Hanzai Japan—“The Saitama Chain Saw Massacre”—so people new to his works can have a taste of what his style is like. In terms of subjects, stories range from incredibly surreal Noir (“Rough Night in Little Toke”) to more haunting questions and the presence of the supernatural (“Outside the Circle,” “Jigoku”) or contemplations about artificial intelligence (“Monologue of a Universal Transverse Mercator Projection”). And while all of them have to do with a crime in some way, all of them take a different tack on it. For example, even though “The Girl Who Loved Shonen Knife” and “The Long-Rumored Food Crisis” both deal with apocalyptic situations and how the main character reacts to them, saying they are “essentially the same” would be like Marilyn Manson playing Beethoven’s Symphony No. 9 in D minor (better known as “Ode to Joy”). While industrial rock and classical music do have the same roots, the energy between the two can be completely different—the mood, the audiences, the emotions evoked, and the presentation. And that is what we have here. 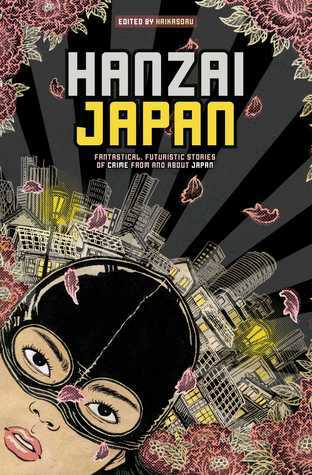 More than just a “variation on a theme” collection, Hanzai Japan is a wonderful gem of genre fiction for anyone interested in double-checking the locks on their doors, securing their windows, and keeping themselves awake at night.